Comedic duo Gamarjobat delivers a gut-busting "silent" performance, leaving AREF OMAR teary-eyed. FORGET about miming clowns with painted faces dressed in black and white pulling on phantom ropes and doing the "wall". Gamarjobat fast-forwards the pantomime routine and adds a mix of panache and street punk aesthetics to send even the most hardened stoic into giggles. Performed by two Japanese mime artists, Ketch! and Hiropon, Gamarjobat's maiden performance at The Actors Studio in Bangsar opened with a street-style mime showcase, involving a suitcase of intrigue, from which they drew out a continuous barrage of jokes. 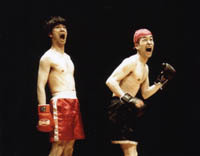 The pair wowed the audience with their "physical wit" in a theatrical performance entitled The Boxer. Aided by some props, music, sound effects and effective lighting, they deftly mimed out various scenes and characters that told the story of a struggling boxer. Together with Hiropon, who sports a similar hairdo in gold, they look like a pair of misfits out to create trouble in their Doc Martens and stove-pipe suits. But what they really do is create is a connection with people by breaking down language and cultural barriers through their silent comedies. "And our Mohawk hairdos are attention-grabbing, making it easy for people to remember us," said Hiropon who loves punk music and Charlie Chaplin. To date, they have been making people laugh in over 100 festivals in 18 countries. They have also appeared on television in Japanese commercials promoting CDs and intend to produce a DVD of their performances soon. "We get ideas and inspiration for comedic material from anything — books, films and newspapers, as well as by just watching people going about their daily lives," said Ketch. "It gets easier with experience but we keep ourselves on our toes by trying to make our shows better. "We also get to ad-lib and act spontaneously, depending on the situation, even though our street shows usually revolve around a particular story or theme." Although they look like a bunch of youths in their 20s, Ketch! is 35 while Hiropon is 40. "I can see myself doing this for the next 40 years," said Hiropon with a broad smile. Laughter is the best medicine, so make sure you treat yourself to a healthy and therapeutic hour with Gamarjobat, which ends its run on March 19.